Here is the print version of the piece I did for McDonald’s that is running in the Northeast market this quarter. I was glad to get my name in the ad and it was really cool to take part in the campaign. 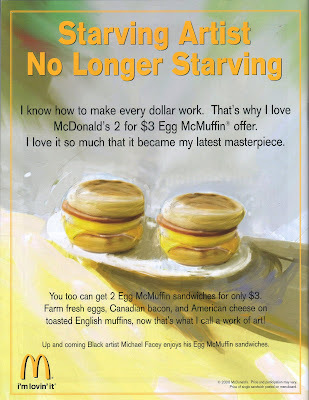 Hey Mike, I am not a McDo goer… but I like your idea, that’s a nice piece of art and it’s great when an artist can earn their living being who they are. I don’t know if we have those sandwiches here in Paris (and if we do, the price may not be that little), but I’ll check and try one, just for you.